Neither start nor end events are not strictly necessary - the diagram below is formally correct. 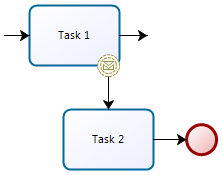 Here Task 1 is the implicit start (no input flows), Task 2 is the implicit end (no output flows). 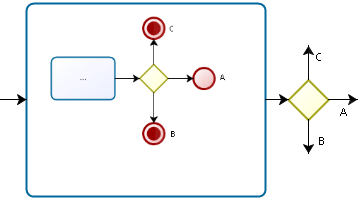 However such diagram looks incomplete and the question arises: was it done intentionally or it’s just a half-work? Therefore the good style supposes the start and end events to be always presented. As for the intermediate none event, it depicts a process milestone. Not necessary yet useful and intuitive. If it came to the link event then probably it’s time for the decomposition - i.e. to leverage subprocesses. I’d recommend avoiding this event. Helpful, intuitive, widely used in practice. Conditional event is helpful in certain scenarios yet it’s not the most intuitive. 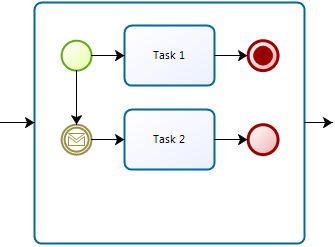 One of BPMN benefits is that, if used properly, it’s comprehensible by users without special trainings. It won’t be the case if conditional event is used. Potential problems of such replacement are excessive engine load and messing the execution log. 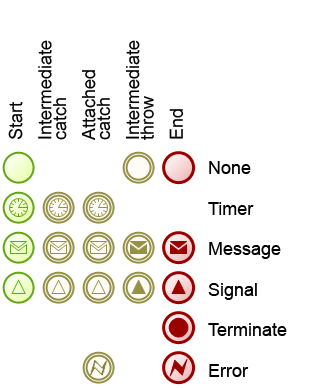 The major inter-process communication tool (along with data-based communications). When dealing with a complex system of processes, this signal feature becomes much valuable. 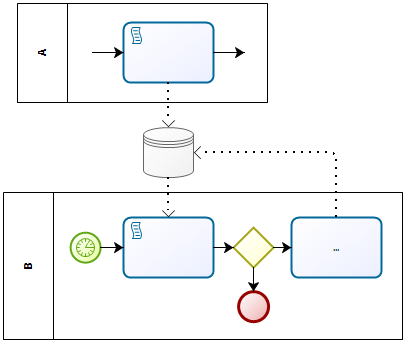 Here process A sets a flag in the datastore and process B checks it periodically. If flag isn’t set then B ends, otherwise it resets the flag and proceeds to the core job. 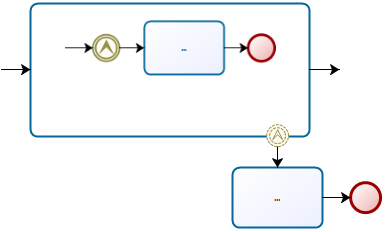 Escalation has a valuable feature - it can create a new token and launch an async control flow in the outer process scope with the help of intermediate escalation initiator and non-interrupting boundary catcher. It’s relatively easy to workaround this event. However in case of many events we’d run into the combinatorial explosion with this technique. Yet in practice I didn’t ever need even two start events. 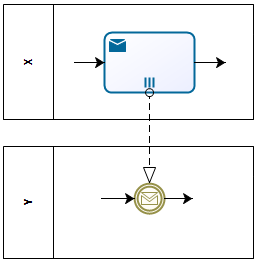 An if I did, I’d use CEP (Complex Event Processing) instead of BPMN. Cancel and compensation events, transactional subprocess and compensation tasks are quite useful in a special scenario “all or nothing”. An example: I’m going to go to the conference. To be prepared, I need: 1) get my submission accepted by the conference committee, 2) book the plane, 3) book the hotel, 4) get my company’s approval on the expenses. It’d be better to perform all the activities in parallel - the less time available, the lower chances to succeed. Every single activity may not succeed and in this case a non-trivial set of compensating activities should be performed, e.g. if the submission was rejected and the plane was booked then the booking should be cancelled etc. Transactions subprocesses and compensations provide an elegant solution to this kind of tasks. However they are relatively rare so one may not care about transactions and compensations most of the time. 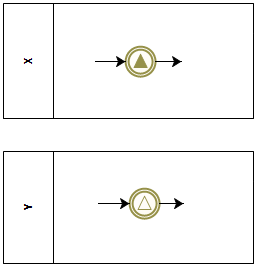 Summing up, 5 event positions from 8 are essential: start, end, intermediate initiator and catcher, attached interrupting (this is actually BPMN 1.x subset). 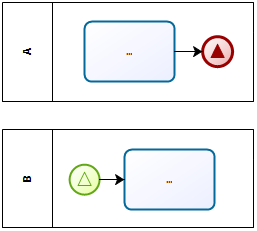 For the sake of comparison, the total number of valid event combinations in BPMN 2.0 is 63. Hi Anatoly, great post (as always)! - conditional events are not very intuitive, but they could be helpful to model data conditionalities (especially as boundary events). Again, easy to explain (same cognitive load as XOR). BTW, camunda BPM supports conditional events. - signal events are very helpful as described in your pattern, especially if you need complex orchestration of multiple instances - the downside being the load on the process engine. Messaging is not necessarily a tight coupling and could be a solution to the load problem, especially at scale (volume + velocity of signals event stream interrogations). - I found in practice that working around specific exotic events by means of subprocesses actually adds to the cognitive load, because it is less intuitive to discern process and sub-process boundaries and scopes, than deal with the same concepts at activity level. Thanks for valuable input. We do not necessarily agree but your comments are always thoughts-provoking. Camunda is great, thanks for another proof. 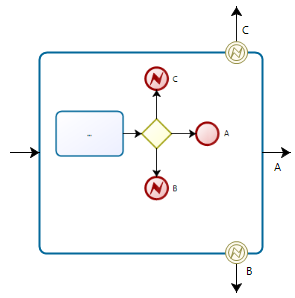 There is a subtle difference between conditional event and xor gateway: if the condition evaluates to true then the process will continue at the gateway but stop and wait at the event set to the same condition. Most people do not realize this I guess. As for the error vs. escalation, we discussed it here http://mainthing.ru/item/446/ ages ago ) The difference between error and escalation is that the former behaves like terminator while the latter does not. I agree that the subprocess workaround does add a load yet it’s more versatile and explicit so it’s worth to come through it once to get more freedom and preciseness. Thanks Anatoly - my comment ref: conditional events and XOR was referring strictly to the similar cognitive burden of having to explain the two to users. I was not implying the two are syntactically similar. As for the Error vs Escalation, I agree on their different End behavior - but isn’t this countering your point in this post that Error and Escalation events are more or less interchangeable?